In Internet browser world, Microsoft Window’s Internet Explorer has always been the biggest player but its influence is on the wane and the decline of the browser hit another milestone this week as its market share fell below 60%. Coming pre-installed on all PCs with Windows, it’s the default internet browser for millions of people and lots of them don’t bother to change it. But looks like increasing numbers of them have been bothering to change it. Fuelled partly by a rise in Google Chrome and steady increase in Mozilla Firefox users, Internet Explorer’s share of the market has dipped under 60%. Fears about viruses targeting users of Internet Explorer have also decreased use of the service. Powered by a big Google advertisting campaign, Chrome overtook Apple’s Safari to become the third biggest browser. Look for more gains for Google here. 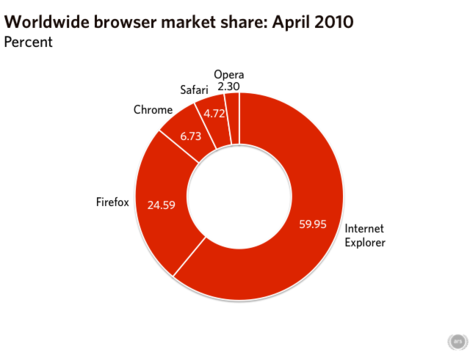 It is only a matter of time before one of Firefox or Chrome overtakes (or at least equals) the market share of Internet Explorer. Competition, in this case, will ensure better security at the browser level. Firefox is slowly increasing its market share of browsers because of its speed,customization options and a number of extensions. When it comes to browser, Firefox still rules the roost. I prefer Mozilla to internet explorer as its speed is slow. Mozilla is far ahead when it comes to speed.